Where Do Animals Go In The Winter? Winter, in all of its frozen glory, is upon us. Since most of our animals live outside, we get a lot of questions about where our animals live during the off-season. It’s different for every animal, but the basic answer is the same: they all stay at the Zoo! This might surprise people, since Indiana winters are known to be harsh and filled with snow. But don’t worry; our animals don’t have to stay out in the snow all season. At least, not all of them. That’s right, some of our animals do stay outside during the winter, because they love the snow! Animals like our Canadian lynx and our Red Pandas are used to living in cold climates, and they have many adaptions that help them survive in the cold. For instance, “Red Pandas have fur covering every part of their body- even the bottom of their paws- to help keep them warm,” says Helena Lacey, Zookeeper. So when our keepers get to the Zoo after it snows, they find those animals right at home in their usual exhibits, enjoying the winter wonderland. The animals that can’t be outside in the cold- like many of the animals that live in the African Journey-have indoor spaces that keep them safe and warm during the winter months. The giraffes have a huge barn that can be seen behind their exhibit where they go into at night and when it’s cold, and our alligators have a building to the left of their exhibit that keeps them toasty warm all year long. Every animal is different, and each species has a different temperature threshold that they are able to tolerate. For instance, our giraffes can’t be outside if it’s less than 55 degrees outside, but our ostrich Penny can withstand temperatures as low as 0 degree Fahrenheit! Others animals, like our African penguins, surprise people- they actually hate the cold! “Most people assume penguins love the snow, but this particular species comes from southern Africa, and they can’t tolerate the cold Indiana winters,” Mitchell Overmyer (Zookeeper- Aquatics) tells us. So on cold days like today when the temperature is below 32 degrees, they stay inside. Our animals stay here all year round, but so do our people. There’s another fact that usually surprises our guests: there are workers at the Zoo 365 days a year, even on Thanksgiving and Christmas! People can be shocked to hear this, but even though our gates aren’t open for the public, someone has to come take care of the animals each day. The Zoo is definitely a lot quieter in the off-season without all the guests around, but even in the dead of winter, the Zoo is always alive with activity! 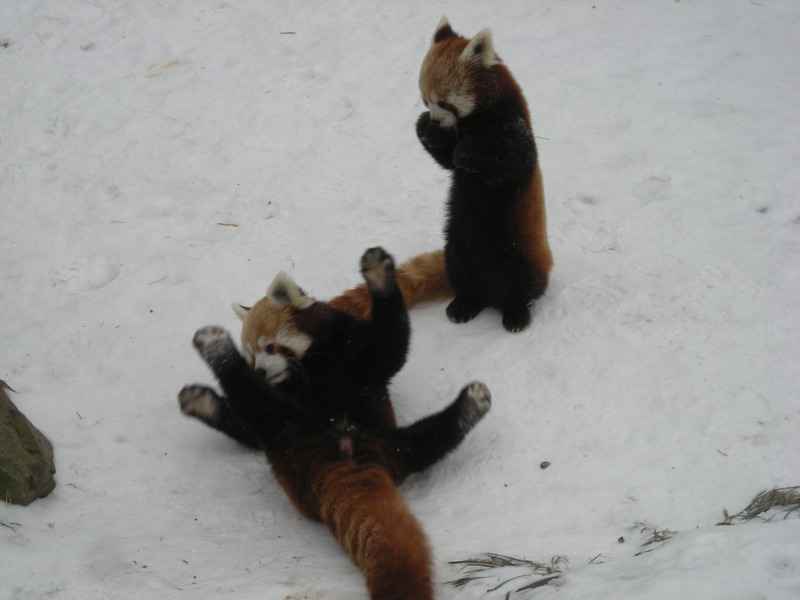 Red pandas love playing in the snow! 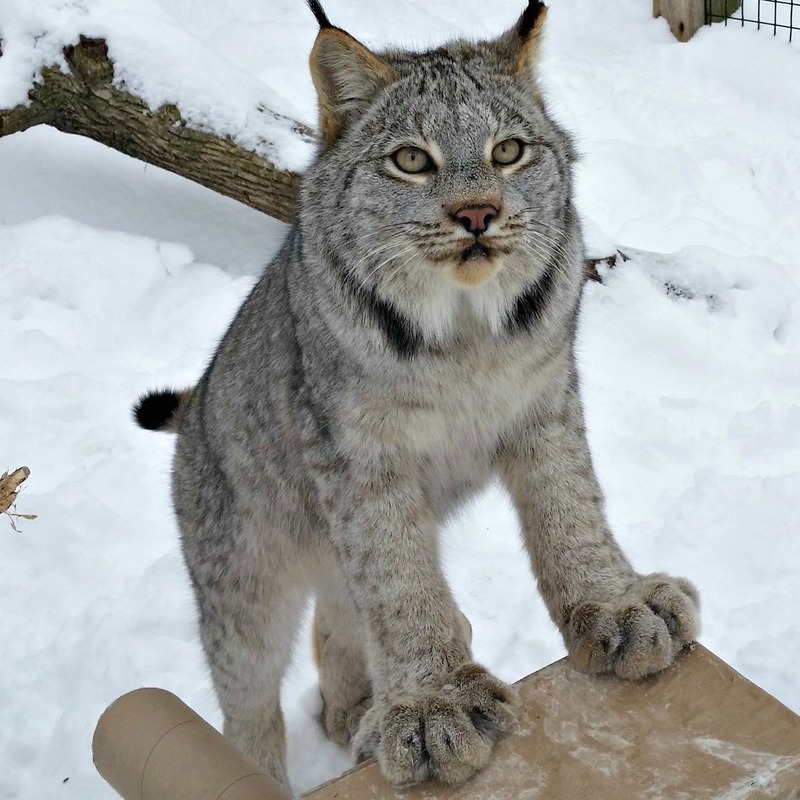 Lynx have large snowshoe-like paws that help them navigate the snowy terrain. 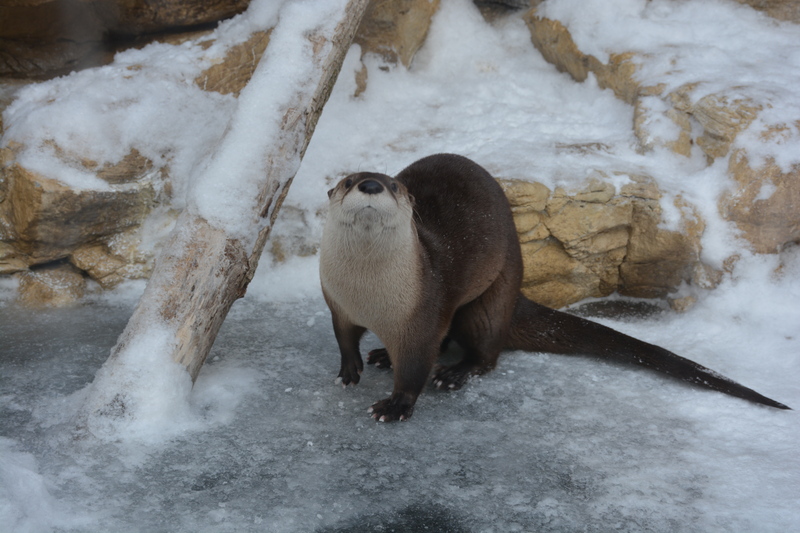 Our otters clearly don’t mind the snow and ice! https://kidszoo.org/wp-content/uploads/2017/10/DSC_2601.jpg 4000 6000 Sarah Dove https://kidszoo.org/wp-content/uploads/2015/03/zoo_icon.png Sarah Dove2017-12-28 11:14:172017-12-28 11:14:17Where Do Animals Go In The Winter? 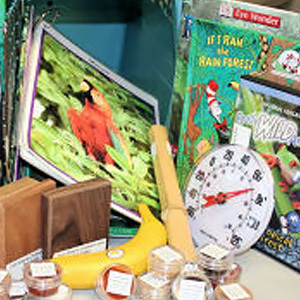 When you visit the Fort Wayne Children’s Zoo and cast your vote at the Kids4Nature Kiosk or round up your total at the Wild Things Gift Shop, you’re helping to protect local habitat with ACRES Land Trust. 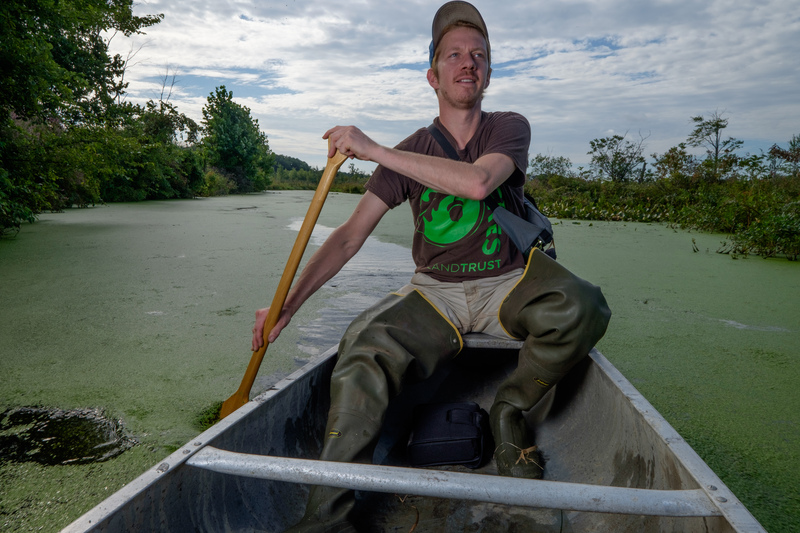 Most recently, your support helped conserve and study Quog Lake, a local, wild and rare quaking bog that is part of an incredible wetland complex in LaGrange County. Over the past few years, through the Kids4Nature and “round up” programs, Fort Wayne Children’s Zoo visitors have contributed $13,500 toward the preservation and study of this 807-acre LaGrange County wetland complex, protected in part by ACRES Land Trust. State-endangered Marsh Wrens and Massasauga rattlesnakes call this secluded wildlife habitat home. Recent bird surveys document 75 bird species in the area; notable species include Veery, Northern Water thrush and a bouquet of warbler species including a Cerulean Warbler. 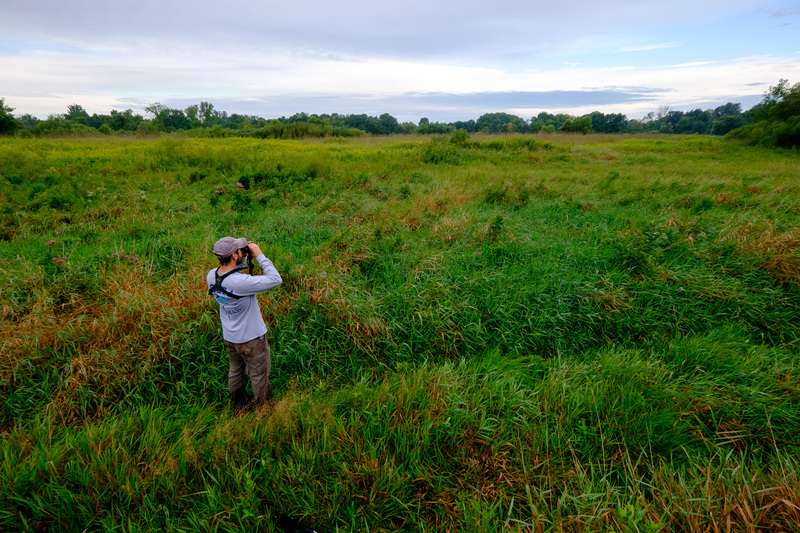 Marsh Wren Nature Preserve, a 50-acre high-quality wetland preserve. Zoo funding created and launched ACRES’ preserve management plan to remove invasive non-native plants and restore critical natural habitat. Quog Lake, a 126-acre wetland preserve that protects one of a few remaining quaking bogs in the state. A quaking bog – the origin of Quog Lake’s name – describes a floating mat of sphagnum moss along the shore of the lake. Zoo funding helped ACRES purchase this land for permanent protection and conduct a plant inventory. Plant life at the preserve includes carnivorous pitcher plants and sundew in great abundance. Did you know that Zookeepers and staff partner with ACRES, too? This spring, a team of eleven bird-brained zookeepers volunteered to count birds for ACRES’ inaugural Bird Blitz event. ACRES’ Bird Blitz welcomed 76 total bird blitzers, who visited 35 ACRES properties, counting 89 species of birds. Their work helped ACRES understand and communicate the value of protecting habitat. These results will be recorded on ebird.org, an online citizen science birding database developed and maintained by the Cornell Lab of Ornithology and the Audubon Society. Thank you for helping protect habitat for local animals when you visit the Zoo. Happy trails! Quog Lake nature preserve’s floating sphagnum moss mat is thin in areas and contains holes throughout, making a trail for visitors to view the bog impossible. The preserve is closed to the public, but will be open for ACRES members 6 am, Saturday, November 11 for a guided waterfowl viewing event. For more event information, visit: acreslandtrust.org/participate/events. Submitted by Lettie Haver, Outreach Manager for the ACRES Land Trust. On the morning of Sunday, August 6th, our giraffe keepers walked into the barn to find a big surprise. 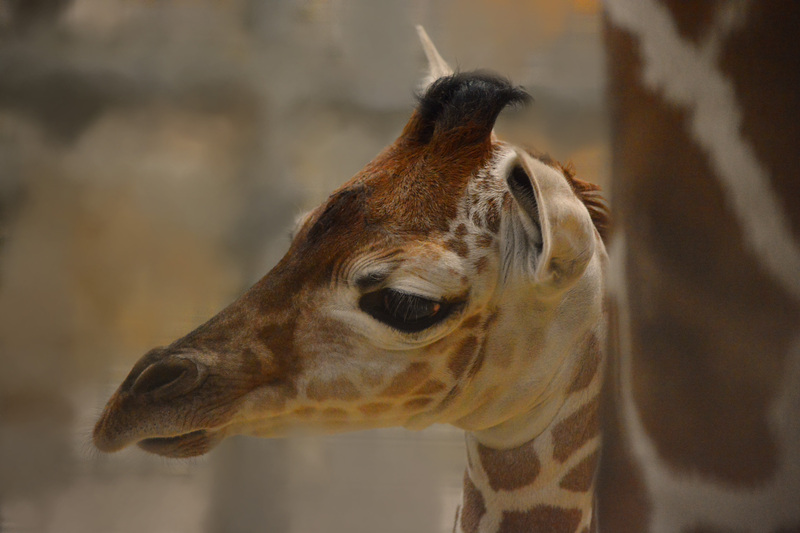 Zahra, our expectant mother giraffe, was in labor! When keepers arrived for their morning shift at 7 AM, Zahra had already gone into active labor, and after a few more hours of pushing, we welcomed a beautiful new female giraffe calf into our zoo family at 9:28 AM! Giraffes give birth standing up, so the baby had a long way to the ground. As the largest living land animal, it’s no surprise that giraffes give birth to large babies- and though our new calf is on the smaller side by giraffe standards, she still weighed 172 pounds and was over 6’1″ tall at birth- that’s one big newborn! She’s growing quickly too- at a week and a half old, keepers estimate her to be 6’3″ now, and is gaining weight right on pace. Just minutes after she was born. Just thirty minutes after birth, the new calf learned to stand, and was aptly given the name Kita, which means “to stand firm” in Swahili. Calves must learn to stand quickly so that they can immediately begin nursing, which is what Kita did shortly after standing. The next day, it was time for Kita’s neonatal exam. At first, she vocalized at the vet staff and ran away! They were finally able to hold her so that the vet could perform a thorough exam, take some blood samples, and make sure she was healthy. “I think she was a little mad at us for a day or two,” said giraffe keeper Aimee after the exam, “but she is now back to readily giving kisses!” None of the tests revealed any concerns, and Kita is a very healthy little girl. 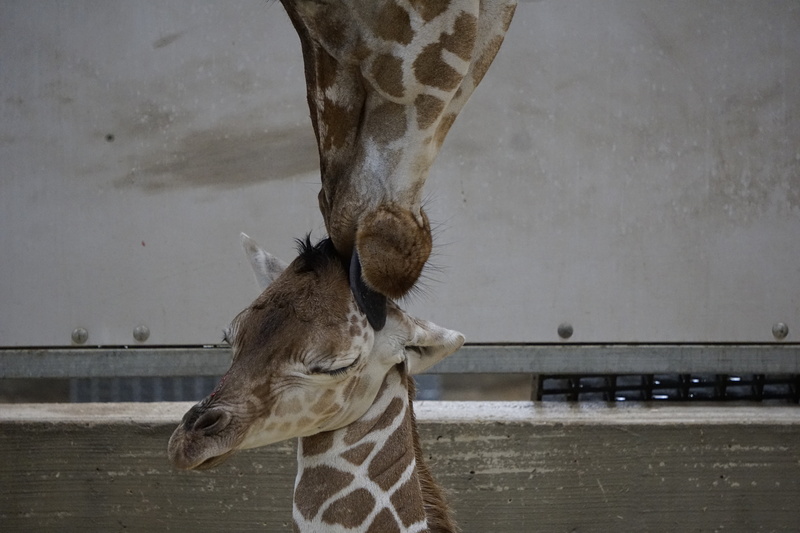 As for the rest of our giraffes- they are simply fascinated with the newest addition to their family. The younger girls, Mystic, Luna, and Faye, rush over to check on Kita as soon as they come inside the barn after being out in their exhibit all day, and her dad and grandparents love interacting with her. She can touch and smell the other giraffes next to her, but does not share a space with them quite yet. As they all get used to each other, she will be introduced to the other giraffes in a shared space, starting with her Grandma Zuri. She already has formed a strong bond with Grandma, who likes to stick close by and watch over Zahra and the new baby. Though Mom lets her little one have fun, she is also extremely protective of her. Kita is Zahra’s second calf with Ezeji, and keepers say that she seems more prepared this time around. Zahra is very wary of new visitors in the giraffe barn, and Kita takes her cues on what to do from Mom. Now over a week old, Kita’s personality is beginning to shine through. She is very curious, and is beginning to show a feisty streak! Keepers say she has started to demonstrate a “sassy personality, and is very similar to how her mother was at that age.” Aimee also reports that though she still naps a lot, like most babies, she often “fights sleepiness because there is so much cool stuff going on in the giraffe barn! Right now, her favorite game is running circles around Mom.” As Kita grows and begins to interact more with the other giraffes, her personality will continue to develop, though her keepers say that she is already more feisty than her brother Kiango was! Kita also loves her keepers already- she interacts with them regularly and likes to watch them work. They discovered that she enjoys their auto waterers, and loves to splash the water up in the air! 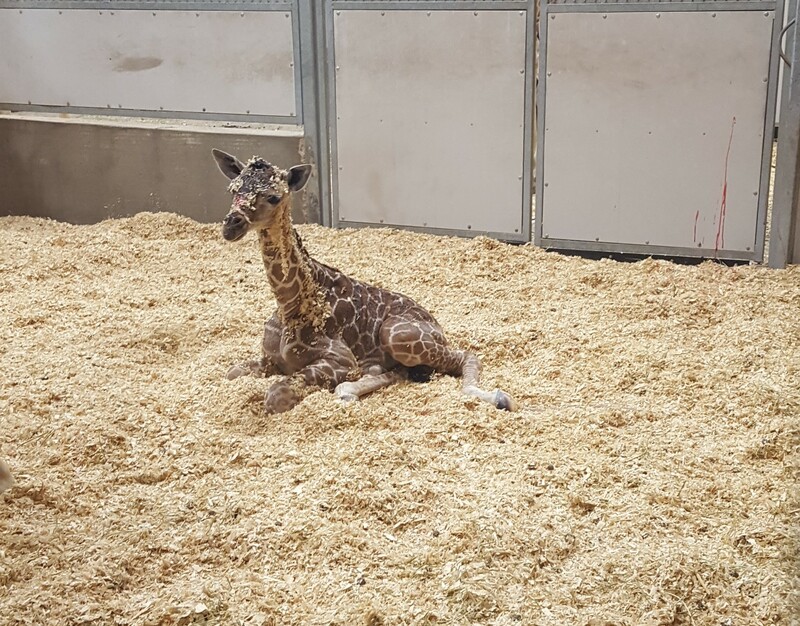 In addition to adding more fun and cuteness to our giraffe herd, this new baby also serves as an ambassador for the declining giraffe populations in the wild. Giraffes are considered to be a “vulnerable” species due to habitat loss and human population growth and illegal hunting. Once widespread across southern and eastern Africa, new population surveys estimate an overall 36 to 40 percent decline in the giraffe population. Our partnership with the Giraffe Conservation Foundation helps to support giraffe research and implement plans to save them. You can help by visiting our giraffe platform and by supporting the Giraffe Conservation Foundation. Despite being the size of a full-grown human, Kita acts just like any other baby would, and spends her days napping, playing with mom, and exploring her new world. Although it will be a few weeks before Kita is able to be introduced to the public, we can’t wait for you all to meet her! Here she is on August 17th looking adorable as ever! After reading our first penguin post, you may think you’re an expert on our tuxedo-wearing birds. Well, you may be, but we’ve got even more fun facts about the lovable creatures. A more commonly known fact about penguins may be this: our African penguins are known as “jackass penguins” due to the braying noise they make. You may have heard their donkey-like screeches when you visit their exhibit at the zoo, but there are a lot of other noises and behaviors they display that are important to their communication. For instance, one of the most popular displays is known as the vibrating head shake, which is where the bird bows the head, brings the bill close to the body, directed downwards and vibrates head from side to side. This can be used as a greeting between two penguins or as a courtship display between two potential mates. Another important behavior is the “ecstatic” display, which is used as a territorial gesture between males to advertise ownership and availability for pairing by performing this display. The bird stands erect and slowly, deliberately, stretches his head and bill skywards, bill opening as head is raised, flippers raised until nearly horizontal. Breast and base of throat heave silently, then develop into throbs, then full braying with head thrown back, bill wide open, flippers beating back and forth in time with breast heaving. The display may last for up to a minute and the period of the display may last an hour or more with 12 or more displays in succession. The ecstatic display can also be made by mated males alone or in the company of their mate, and after an encounter with neighbor or rival on site. Braying and hissing can also be used by juveniles toward adult birds to communicate various things. Since our penguins are extremely social birds, they usually stay very close together. Although one may wander a little farther away to explore a new part of the exhibit, they usually come back to the main group very quickly! 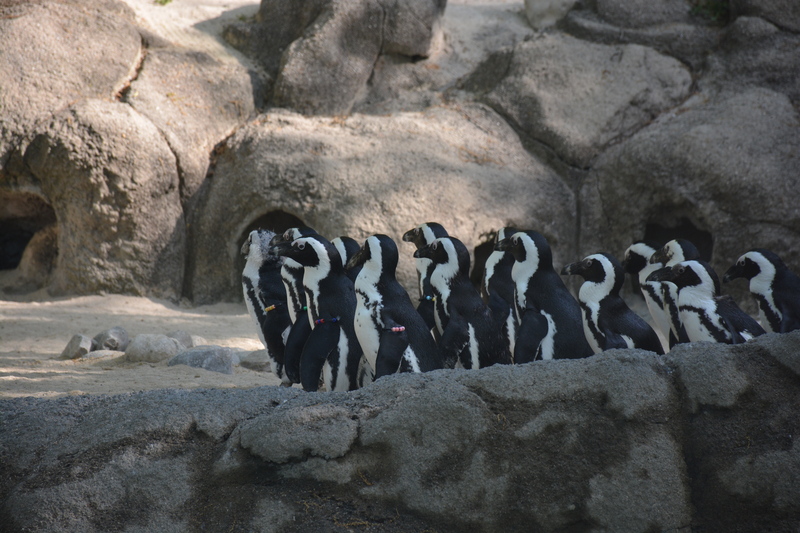 Even in the wild, African penguins form large colonies on land to reproduce, molt, and rest together. Although panting and using their special glands above their eyes helps them to cool down, sometimes our penguins like to take a good ole’ fashioned swim to beat the heat. In the wild, African penguins spend most of their time in the water foraging for food, but also use the cool water to bathe and cool down in! In the zoo, our penguins don’t have to hunt for their food, but you can often find them swimming laps just because they enjoy the water so much. 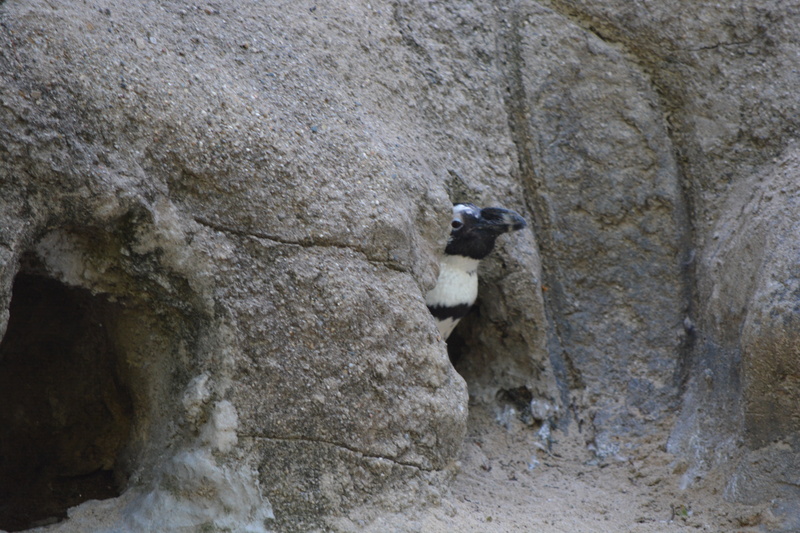 Besides being cute and interesting, our African penguins also love to have fun! Although they are often found burrowing with their mates in the shade near the back of their exhibit, they also love to chase things. Sometimes you can see them waddling quickly, trying to catch flying insects! In fact, they all love doing this so much that one of their enrichment activities involves blowing bubbles and encouraging the penguins to chase them throughout their exhibit. Spend some extra time near their exhibit and see if you can catch them in the act displaying any of these cute behaviors! The #InvestInTheNest campaign that we have partnered with for the past month has seen amazing success! Although the original goal was to reach $150,000, that total was exceeded before the official end of the campaign! As of June 16, the last day to donate to the cause, the total pledged is $181,568!! We’re so grateful to everyone who donated to help save this vulnerable species. If you don’t know about the Kickstarter campaign, it was started to help raise funds to build artificial nests for the African penguins in Southern Africa. Due to over harvesting of penguin guano, which is used as fertilizer, penguins are left with nothing to build their nests with, and have to resort to building them out of trash and other less than ideal materials. This leaves the new penguin chicks vulnerable to predators. But thanks to support of people like you, we will now be able to build 2,000 hand-made nests for the penguins who so desperately need them! We love our adorable, fun, and spunky penguin friends, and know that you do too! 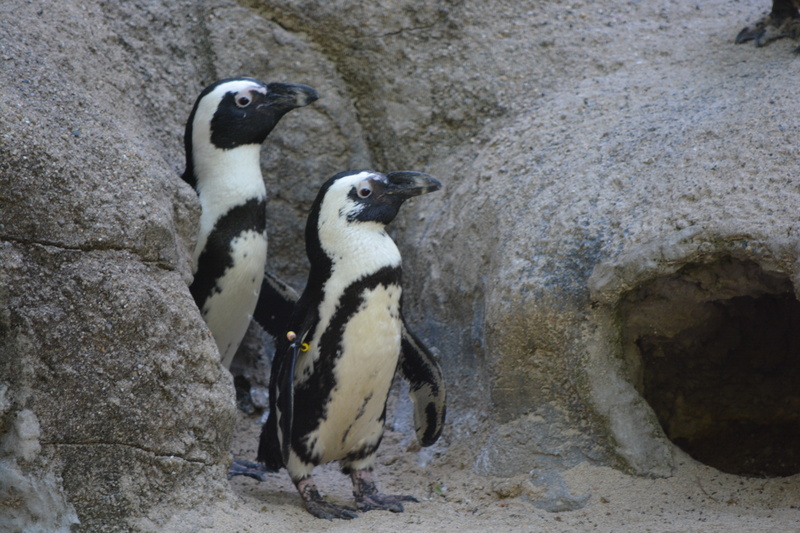 Donating to causes like Invest In The Nest is a great way to help this endangered species, but supporting your local zoo and all zoos and aquariums that house African penguins is another good way to help out. If you visit our zoo, be sure to stop by and see the penguins in their exhibit- but be careful, because they just might waddle away with your heart! See the Fort Wayne Children’s Zoo in a whole new light- moonlight! 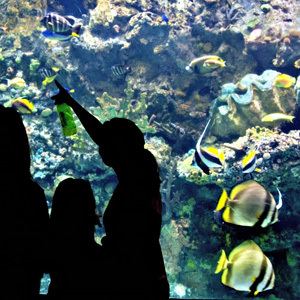 Guests attending the popular Wild Nights program will enjoy after-dark adventures, nature activities, and animal encounters, then sleep indoors next to the sharks! These special Wild Nights are specially designed for organized groups such as schools, scouts, and youth groups serving children ages 7-12. *except for Family Wild Night dates. All programs require advance registration and openings are limited, so register early to avoid disappointment! You will receive confirmation of your registration. Call our Education Department at 260-427-6808 to reserve your Group Wild Night date. A $50 deposit is required. Wild Nights Cancellation and Refund Policies: Children must meet age requirements on the first day of all programs (no exceptions). Programs are held rain or shine. Refunds (minus 10% processing fee) are available if you cancel at least 14 days in advance. No refund if you cancel less than 14 days in advance. The zoo reserves the right to cancel camps with insufficient registration. In the event of such a cancellation, all of your fees will be refunded. 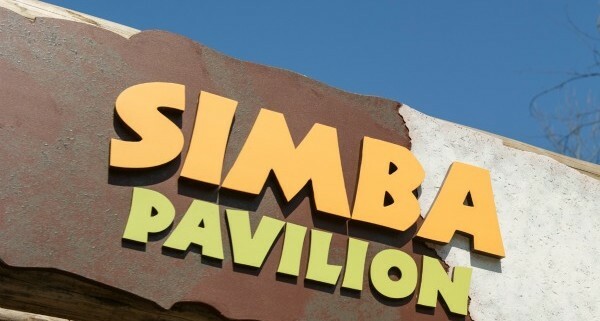 Treat your employees or members to an unforgettable outing at the Fort Wayne Children’s Zoo! With more than 1,000 animals and five amazing rides, the zoo is your number one destination for quality recreation. At the Fort Wayne Children’s Zoo, you’ll get nose to nose with lions, tigers, orangutans, and more. You can even feed a giraffe! Kids and adults alike will make memories to last a lifetime. Plus, your visit supports important conservation programs around the world. For more information about corporate picnics and group sales, check out our 2019 Group Sales Guide. Contact the Group Sales Manager at 260.427.6806 or groupsales@kidszoo.org today to book your event! All pricing is subject to change without notice. A minimum deposit is required to reserve your date.